Usher in the Lunar New Year and celebrate love this springtime with your family, friends and loved ones at Sentosa! The State of Fun welcomes guests with Love in Springtime ( 爱在春季 ) - a series of exciting festivities, auspicious promotions, and fun activities from 21 January to 26 February, including FREE island admission and cable car rides for guests born in the Year of the Rooster! Love in Springtime brings together two of the biggest occasions in Chinese and Western cultures – Lunar New Year and Valentine’s Day. 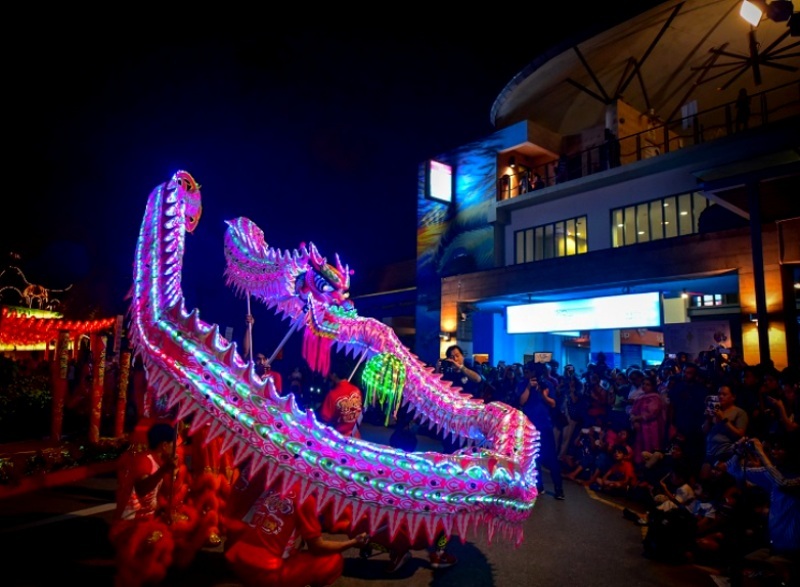 Areas including Palawan Green, Merlion Plaza and Beach Plaza will turn into a festive playground of lights, entertainment and activities for everyone, with a captivating showcase of 12 Zodiac lanterns at Palawan Green, each stylised to tell heart-warming love stories. The highlights also include Merlion Magic Lights! as well as a concert beside the beach on the 15th day of the Lunar New Year, featuring well-known folk songs by active members from the 1980s local music scene. That’s not all! Special promotions from Festive Bundles (福袋) to lucky draws for Mastercard cardholders are in store for guests of all ages, including families and children! “Love in Springtime celebrates togetherness, love, and wishes for a bountiful year – ideals that transcend cultures. Our line-up of activities offers both traditional and unconventional options for those seeking a fun-filled spring celebration of love. The festivities provide great opportunities for families and friends to come together and celebrate in The State of Fun. As we march into the year of the Rooster, we wish our guests a year of luck, prosperity and good health,” said Ms Agatha Yap, Director of Sales & Marketing at Sentosa Development Corporation. A Special Treat for those Born in the Year of the Rooster! Guests born in the year of the Rooster will get a rousing start to the Lunar New Year with exclusive perks! They can enjoy one FREE island admission ticket and one free Singapore Cable Car Sky Pass for use within the first three days of the Lunar New Year (28 January to 30 January). Guests just have to present their identity cards to collect the complimentary tickets at the redemption booth at Sentosa Station ( Vivocity ) from 21 – 22 January, 9am – 9pm. Terms and conditions apply. Love in Springtime encourages all to celebrate love in its many forms, with abundant opportunities for families and loved ones to bond. Strike a pose in front of 12 huge Zodiac lanterns at Palawan Green, and enjoy stories of kinship, friendship and romance from 21 January to 26 February, 11am – 11pm. Measuring up to two metres in height, the lanterns feature light-hearted depictions of acts of love by the 12 Chinese Zodiac signs. Learn about the meanings behind each story and take pictures with the colourful lanterns in the day, or bask in the glow of the lanterns after dark. As the night falls, all eyes ( and ears ) will also be on our beloved Sentosa Merlion, with the Merlion Magic Lights! The ever-popular light show will feature projections of icons and colours, coupled with music, for a mesmerising performance. Showtimes from 21 January to 26 February start at 7.45pm, with 30-minute show intervals till 9.15pm. 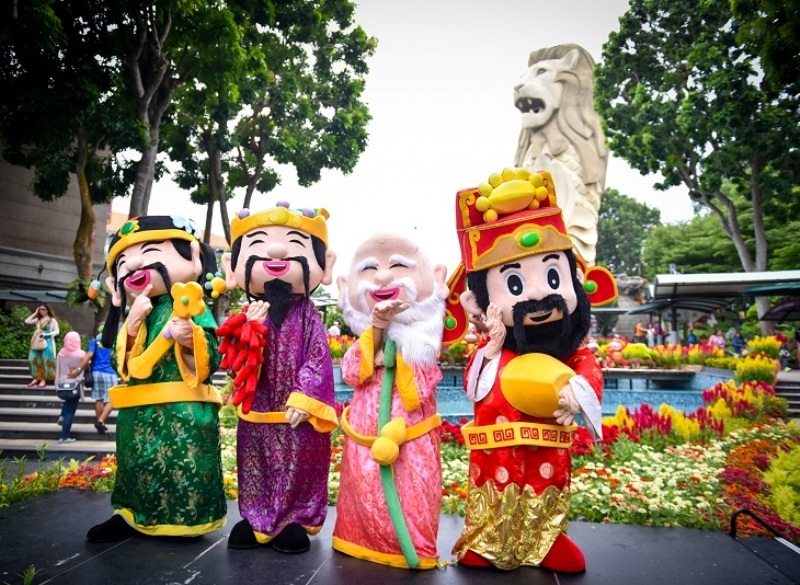 Two additional shows will be held on weekends, eve of public holidays and public holidays. That’s not all. Guests can also enjoy FREE Tang Yuan ( sweet glutinous rice balls ) and have a picnic on the 15th day of the Lunar New Year ( 元宵节 ) at Palawan Green, while they enjoy a mini concert, Thank You For the Music ( 音乐的傻瓜 ). Bond with your extended family or friends over folk songs, oldies and Xin Yao music by active members from the 1980s local music scene, or enjoy the love songs as couples celebrate the special day, which is also considered the Chinese Valentine’s Day. This is the first time that this concert series is held outdoors. 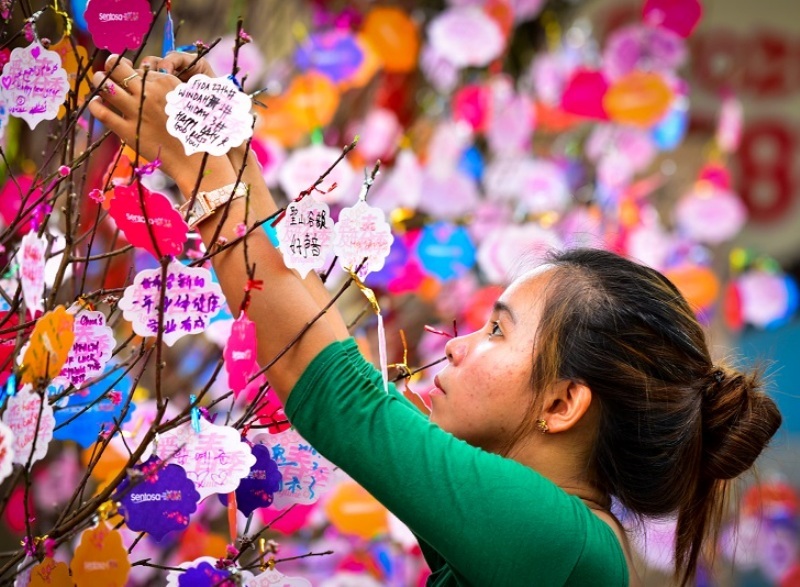 More festive activities will be lined up at Merlion Plaza and Beach Plaza between 21 Jan and 26 Feb, including Pen-A-Wish trees, Prosperity Drums, and the debut of the “Ai at First Sight” sculpture by local artist Peter Draw. 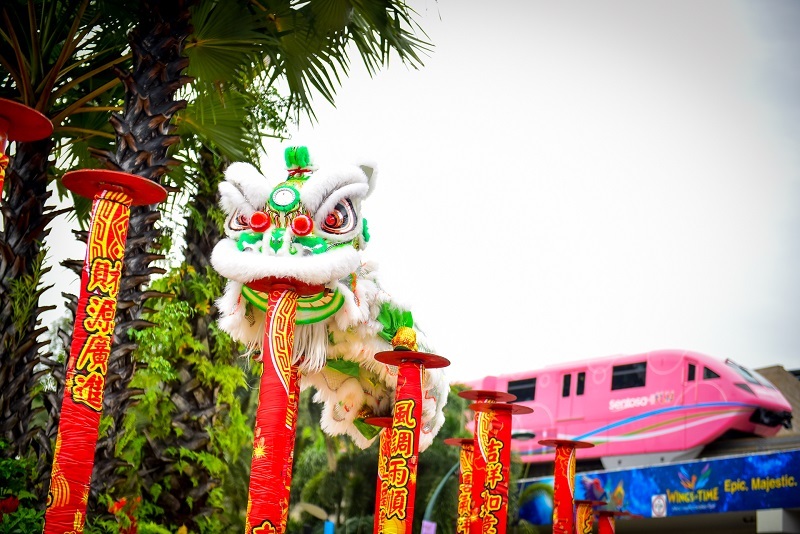 Also from 28 to 30 January, guests will be entertained by lion and dragon dance performances, Chinese circus acts, a palm reading kiosk and more! 90 Days of Fun, an unprecedented series of promotions and deals on the island resort, will continue to add festive cheer until 9 February. Guests can check out www.sentosa.com.sg/90daysoffun as new deals are unveiled each week. From 13 January to 12 February 2017, Mastercard cardholders will be able to purchase Festive Bundles ( 福袋 ), filled with Sentosa attraction passes and F&B deals. Mastercard cardholders can also win attractive prizes in the Spin-the-Prosperity Wheel lucky draw. In addition, popular island attractions will offer festive programmes and dining options in conjunction with the celebrations. At KidZania Singapore, kids can not only enjoy role-play activities, learn to make Lunar New Year decorative items, but also receive red packets of KidZos ( the kid-sized city’s currency ). Foodies can meanwhile eat their way through Lunar New Year at celebrity chef restaurants and stand to win prizes in lucky draws at Resorts World Sentosa. For a different take on the celebrations, families and friends can choose to tuck into barbeque delicacies at the BBQ Beach Party on 21 January, held at Wave House Sentosa. For more information on Love in Springtime and its fringe activities, please refer to the Annex, visit www.sentosa.com.sg/cny or call 1800-SENTOSA (7368672). I really want to go back to Asia for the Lunar New Year one year soon. Such amazing celebrations, love to see all those beautiful tradition in your country! Beautiful photos, Shirley! What a delightful and colourful celebration! Such a funny Festival to celebrate love!!! Nice to combine CNY and Valentine's in one. Happy and prosperous Chinese New Year to you and family. Great. Such a fab to read through this happy post. so many perks and happenings at Sentosa, sure this place will attract a lot of visitors. Wow it looks so festive in Singapore!! :D I love the decors! Wishing you and your family a very happy Lunar New Year! lucky those who are born in the year of the rooster! I would love to visit this island, this place seems amazing. Happy Chinese New Year! I really want to experience the Lunar year festivities. Happy Chinese New year! I never been to here. It look like a great place to visit. Whoa...nice things to see and interesting stuff to do. I wish I didn't live so far away!